â˜… PUT ME IN COACH -1st Elite's premium 100% Cotton based Athletic Tape is your premier choice in joint protection. Latex free, our self adhesive wrap is easy on skin and offers a tensile strength that really safeguards your most vulnerable joints! â˜… ALL FOR ONE -No matter if you're the coach, personal trainer, or just an everyday athlete, our ten yard spools are sure to last while offering reliable rigidity to sensitive fingers, toes and joints. â˜… STAY PUT -While some tapes offer too much stick irritating the skin and others just won't stay in place, we've given our remarkable tape the perfect amount of adhesion to make sure it stays in place, but won't be a hassle to remove! 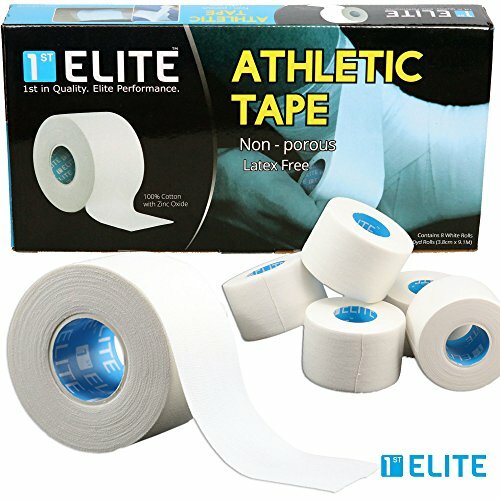 â˜… PROFESSIONAL GRADE -Forget low quality stability tapes, and buy a step above with 1st Elite! Anyone who knows proper protection knows that we've done it right, and for the right price. â˜… GUARANTEED -Best of all, we're always here for you! If we don't meet your needs, all you have to do is let us know. It's really that easy. You'll never be told you can't return or be refunded here!